Small commercial remodels often trigger the requirements to make their facilities accessible for the disabled. Commonly known as ADA access, this is from the Americans with Disabilities Act, federal civil rights law. 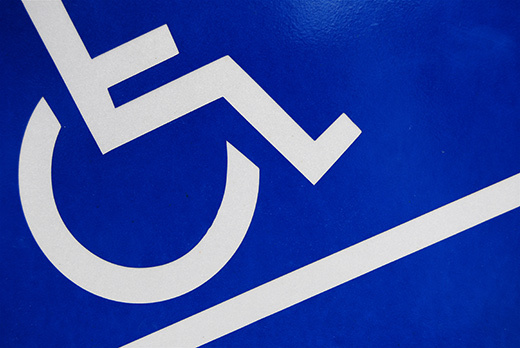 Simply put, the ADA is the law that the “wheelchair activists” use to sue owners and tenants. There is also the California Building Code, which requires accessibility features for the disabled. The Building Code requirements are applied to your project when you apply for a building permit. I can’t tell you how many times we’ve had to tell clients that their tiny, tiny, remodel will trigger accessibility upgrades, and how disappointed they’ve been to learn that the project will require some reasonable accommodation. However, in the building code, there is such a thing as a Hardship Exemption. The rule is this: you will be required to spend a maximum of 20% of your construction budget on accessible features listed in an order of priority, unless the total valuation of your project exceeds $132,536 ( for 2011). This number comes from a formula that increases every year. If it is above this number, you’ll be required to provide a minimum of 20% for accessibility and possibly more. How much more is at the discretion of the building agency to determine how much over this 20% constitutes a hardship upon reviewing the particular circumstances involved. They ultimately want to see buildings become completely compliant. So if your total construction valuation is substantially above this and you have out of date toilet rooms that don’t meet code, there is a good chance that you’ll have to bite the bullet and upgrade them. The order of priority in accessibility features start from access to the building, through the building, accessible toilet rooms, and then on to other features such as drinking fountains. And on that note, I was just talking to one of our general contractors yesterday, he was saying that the costs for an accessible single occupancy toilet room for his project was around $21,000. Expect that number to vary with site conditions. This is something tenants need to negotiate with their landlords before they sign the lease. Negotiate for them to contribute to accessible upgrades if they are required, and clarify in writing who will be responsible for exterior compliance if there is a shared parking lot and sidewalks.